If you want to make your romantic getaway even more special, we have the perfect date idea for you! Maui dinner cruises are a wonderful way to marvel at the island’s natural beauty while enjoying a unique dining experience. You can surprise your better half or plan it together, but don’t waste time sorting all the companies out! We’ve already done it for you. Read on to discover the three most romantic Maui dinner cruises and start dreaming about your next vacation today! Have the Date Of a Lifetime With These Maui Dinner Cruises! A Pride of Maui Sunset Dinner is one of the best ways to spend your evening! Not only is it a delight for your palate, but also for your eyes. Treat yourself to a cold margarita and gaze at Maui’s rocky coastline in the arms of the one you love. You can have a “Jack and Rose” moment, then come back inside to enjoy a delicious dinner of fresh fruit and grilled meat. Dine to the tempo of the live music and hit the dancefloor! From flamenco to jazz to blues, the band’s repertoire is endless. Trilogy’s luxurious Captain’s Sunset Dinner Sail offers breathtaking views as well as a unique culinary experience. Get some alone time with your better half on the impressive catamaran and soak in the marvelous landscape on the horizon! Dinner includes three courses with an entree of your choice. Desserts and drinks can be enjoyed at sunset, so make sure you bring your camera! It’s the perfect occasion to take that picture that will make all your friends jealous. Sail into the “Golden Hour” with Kai Kanani Sunset Sail! The ocean looks amazing from the deck of Kai Kanani’s catamaran. Drink a delicious cocktail as you marvel at the magical yellow light reflecting on the water, and breathe in the salty air as you sail away from the shore! Get a taste of paradise with MauiWine’s Lokelani sparkling wine and make lifetime memories with your significant other. After a delightful evening, you deserve to come home to a beautiful vacation rental. 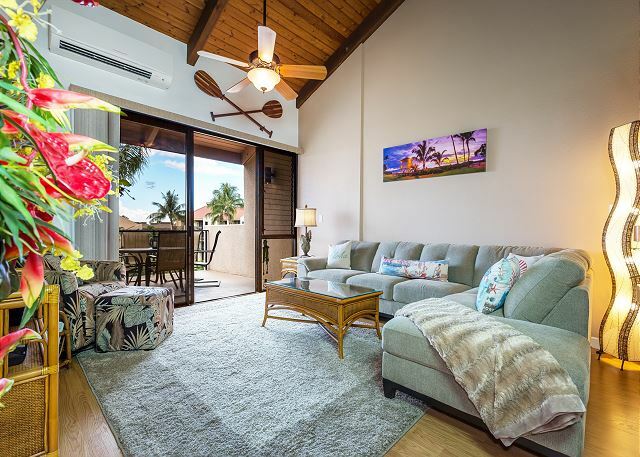 Luckily for you, PMI Maui has the Hawaiian home you’ve been dreaming of! 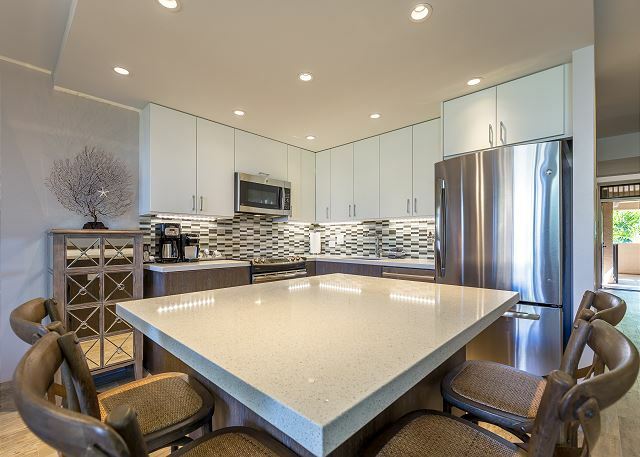 Between lush gardens, modern amenities, and stunning ocean views, you’ll feel like you are in paradise. 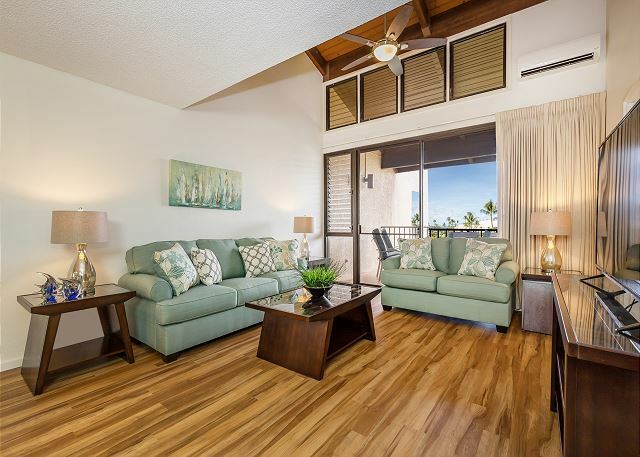 Book our Maui Kamaole Sands 3-106t! This stunning one-bedroom is a dream-come-true for couples wanting to escape their routine and find paradise! Let the earthy colors of our splendid unit soothe your soul and relax in the best setting possible. We offer modern amenities that will make your trip easy and convenient. 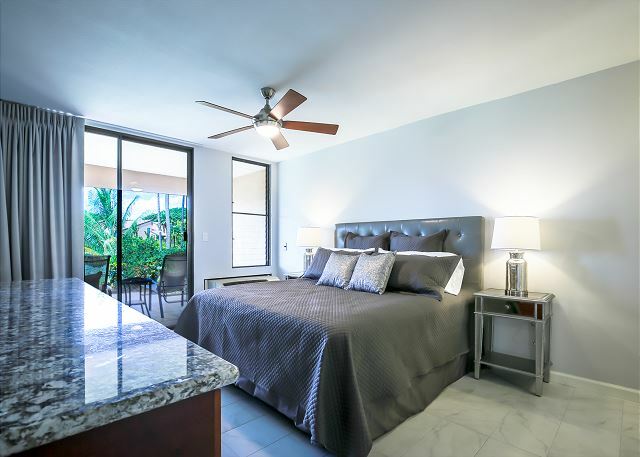 Cook a delicious meal in your fully equipped kitchen, sip a glass of wine on your balcony overlooking the garden, and dream away in the comfy king-size bed!